Dodanwela is located 14 km east of Kandy and only 1 km west of Danthure. When King Rajasinghe II came along Dodanwela during a war with the Portuguese, he rested at the temple of the local deity, which then was names Nahimige Kovil. The king made a vow to donate his crown and crown jewels to the god after a victorious battle against the Portuguese. After winning the war, he indeed left his crown. It was transferred to a museum in Kandy for safekeeping. This turned out to be a mistake, as the crown was stolen from there. The local deity worshipped in an iconic form was later on identified with Vishnu. This is why the Dodanwela temple is known as a Vishnu Devale now. 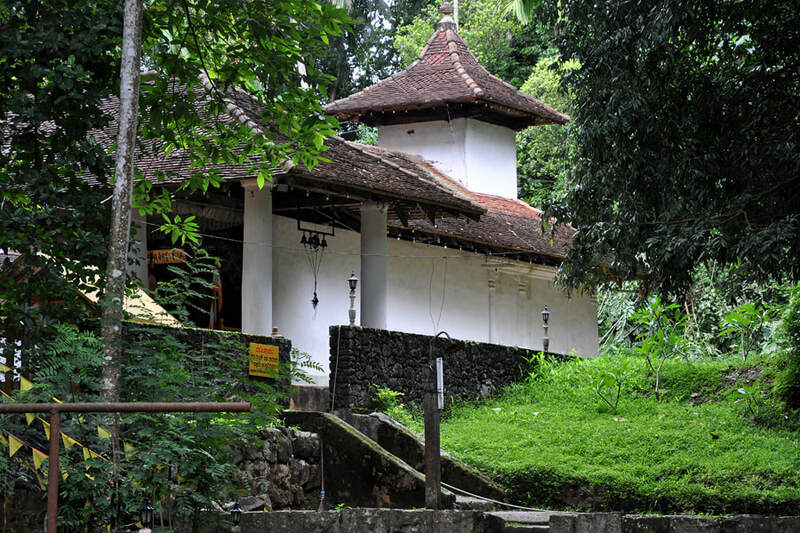 The architecture, with an open hall in front of the shrine room and a stairway at the slope in front of the temple resemles that of the Vishnu Devale in Kandy. Remarakbly, there is another similarity between Dodanwela and Kandy. The Vishnu Devale in Kandy is located in close proximity to Devales (Devalayas) of Natha and Pattini. This is the case in Dodanwela, too. A Pattini temple is only 80 m southwest of the Dodanwela Devale dedicated to Vishnu. A Natha shrine is 80 m to the northeast. Together with Kataragama, the three gods in Dodanwela formed the pantheon of highest gods of Sinhalese Buddhism in the Kandyan period. According to rock inscriptions from the late Middle Ages, Natha was originally a deity helping Sinhalese warriors from the Kandy region in combat. Interstingly, his role changed after the arrival of the Portuguese and the establishment of Kandy as the powerhouse of Sinhaleses independence. The Local legend of Dodanwela has it, that Natha Deviyo was defeated in a battle by Pittiya, a divine newcomer to the Kandy region. Afterwards Natha retreated to an elevated position by following the path to Buddhood. The myth emphasizes that there are victories of higher value than winning military combat. Natha remained to be the guardian deity of the Kandyan heartland, from now on as a protector of its religion. The Perahera at Dodanwela Devale brings back the memories of the much earlier Kandyan war of the first Kandyan King, Wimaladharmasuriya, against the Portuguese invaders. In this Perahera, an original royal palanquin is taken in procession.